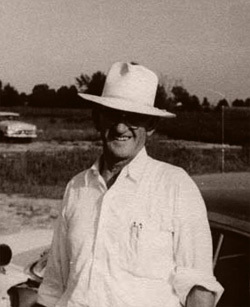 Daddy Hinkle’s is built upon and dedicated to the story of J. Frank Hinkle. The company’s history began with the dreams and the work of his grandchildren. It will continue with his great-grandchildren, and hopefully with his great-great-grandchildren and beyond. Daddy Hinkle’s father was born in 1860 in Missouri at the beginning of the Civil War. 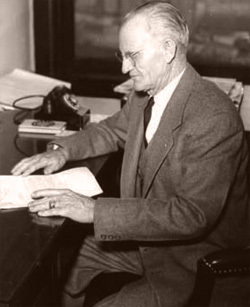 By the time J. Frank was born 26 years later in 1886, the family had moved to Arkansas. Later, they would travel through Paris, Texas, and finally they would reach the Oklahoma Territory around the turn of the century. In 1901, J. Frank’s mother died after giving birth to twins. After his mother’s death he was sent back to Arkansas to live with his oldest sister, Lucy. The young man was very much on his own at the age of 14 when his life of work and adventure began. His father was a water well driller and probably this early exposure to drilling and finding unseen treasures beneath the earth’s surface stayed with the boy for all his life. James was a bright, skinny, red-headed lad. He had a quick mind. Influenced by his father’s business he became very good with tools and at repairing equipment. He also was inventive, a very quick study, and not afraid of hard work. In search of his destiny he traveled all over and worked at any job he could find. He finally found his calling in Texas. Oil was the new gold at the turn of the century. He began, like so many other men, in oil fields of Texas as a rough neck. Then by his ingenuity he worked his way up to driller, then tool pusher, then with parts from junkyards and his own hands he built his first steam-driven oil rig and began contracting drilling for oil in Oklahoma and later in southern Illinois. 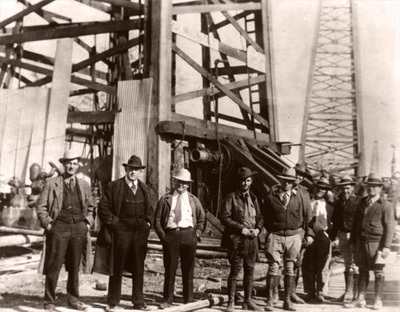 His career as an oilman began in a time when America was undergoing great change after WWI. It began in a time of wooden derricks and horse-drawn wagons and gave way to diesel trucks and steel and bulldozers before the beginning of WWII. Oil would be king, and James, who would become known as Daddy Hinkle after 1942 with the birth of his first grandsons, would use oil to build his company and give a good life to his family. He would use every bit of his skills and entrepreneurial spirit to build an Oil Drilling Company that would afford him the ability to give his family an upper middle class lifestyle. Daddy Hinkle’s story is that of a truly self-made man. Like all of us he was not a perfect man, but a man who followed his dreams and always did the best he could and a man to admire. A man with little more than a second grade education would see his children and all his grandchildren receive the best opportunities and educations that he himself could never even have imagined as a young man. He would also help so many of his family try to realize their dreams by owning their own businesses as he had. As an oilman, Daddy Hinkle entertained a lot of people in restaurants and especially at his lake home in Decatur, Illinois. He loved a good T-bone steak. His wife, Zula, who later would be know as Mamaw to everyone, “doctored up” the steaks with a combination of garlic salt, tenderizer, celery salt, paprika, seasoned salt, pepper and every thing else she could find in the kitchen cabinet. Whatever the combination of seasonings, the steaks proved to be irresistible to one and all of the parade of guests, family, and business associates that dined at Daddy Hinkle’s table throughout his lifetime Today the marinades, seasonings, and rubs baring the name Daddy Hinkle’s are sold in an ever-increasing number of states though out the USA.In December of 1994 we sold 9 cases of Daddy Hinkle’s Marinade to our first customer. David Hinkle Southard, Daddy Hinkle’s grandson now heads up the company. He continues in the traditions of Daddy Hinkle and brings to each of our customers the same care his grandfather gave his. He hopes that Daddy Hinkle’s Marinades will become a family tradition someday in every home in America. We think Daddy Hinkle would like that.